Need to reach more local customers? Our promotional door to door flyer and leaflet distribution marketing campaigns are bespoke to your business advertising needs and achieve direct delivery to your prospective client's residential or business doorstep. Need to reach more local people? 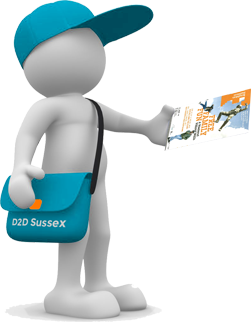 The D2D Sussex Distribution Team deliver flyers, leaflets, marketing and promotional materials to business owners and residents letterboxes. We deliver throughout Sussex including the rural districts of Arundel and Lewes and the mainly urban areas of Eastbourne and Worthing. From Door drop flyer and leaflet distribution to web design, email campaigns and optimisation, we help you reach new customers. We always aim to please Our Clients. that is why most stay with us. Read what lots of our customers have said about our services. D2D Sussex gives a very friendly, quick and reliable door drop service. We were updated regularly. We will use D2D again for our Brighton, Hove and Shoreham leaflet distribution! Thank you to Sonya and the Team for safe door to door delivery of our leaflets in Hove. We have had great response from this. The regular email updates from Sonya was extremely helpful and the mapping out of distribution areas was most professional! I found Sonya to be very helpful and flexible with my Brighton & Hove leafleting campaign, and we started getting enquiries almost instantly! Highly recommended! Thank you for your hard work and regular delivery updates. We will certainly be using you for all our future door to door leaflet distribution. Very impressed! We are very happy with the door to door service provided by D2D. They offer a friendly, competitive and efficient door drop service and even offered to help us with our designs for future leaflets!